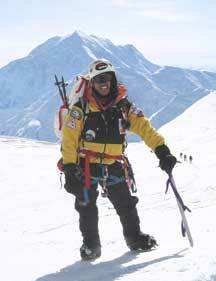 Robert Chang is a mountaineer, rock climber, professional mountain guide and inspirational speaker. He started climbing in 1987 and has ventured all over the globe. He has climbed in Peru, Argentina/Chile, Mexico, Canada and extensively in the United States and Alaska. He has been on 6 expeditions to the Nepal Himalaya that include summits on Mount Everest, Ama Dablam and Imja Tse. He enjoys all disciplines of climbing from frozen waterfalls, to the big walls in Yosemite, to the cozy confines of an indoor rock gym. His climbing adventures have defined the core of what he calls “life’s expedition experience”. In 2002, Robert was diagnosed with the auto-immune disease Graves'. He subsequently had his thyroid gland inactivated through Radioactive Iodine-131 treatment (a type of radiation treatment that kills the cells in the thyroid gland to neutralize it). Rob must take replacement hormone medication daily for the rest of his life and this reliance on an outside source of "energy" has made his climbing goals more difficult. But as in climbing, the challenge is not in the easy aspects of life, it is in the things that bring out the best qualities. Rob founded Climbing For A Cure after his beloved sister, Marie, died of a rare form of cancer in 2001. Rob Chang and his team have joined together to form the Everest Climbing For a Cure Expedition 2005 (ECFACE 2005) which reached the summit of the world’s tallest mountain in May of 2005. This ascent was even more spectacular as Everest legend Apa Sherpa was the Expedition Sirdar. 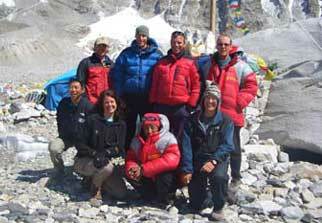 Apa set a new world record for the most summits of Everest with 15. "Climbing a mountain like Everest, takes a lot of team work and making the right small decisions for success in the long-run," --- "Living a healthy life also takes team work and realizing that small decisions can influence one’s long-term health. That is the message we convey on all our climbs - including to the top of the world." Sometimes dubbed as one of the most “unintended climbers”, Robert’s multi-media presentation inspires audiences at all levels. From his very humble beginning – in which he confronted his fear of heights, dislike towards outdoor activities, to his new found role and its adjoining responsibilities as a guide, to climbing mountains at extreme altitude, the story of his journey transcends the difficulties that all people encounter in real life.